This item is an image. It was created by an unknown creator on or around the date time period: ca. 1910-1920. Poster. 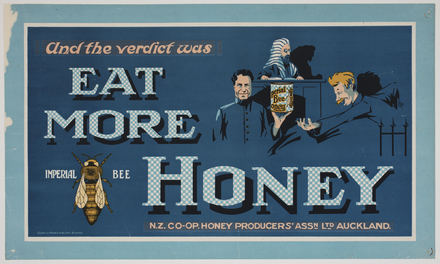 Text on a blue background "And the verdict was Eat More Honey". Illustration of a court judge, a man holding a tin of Imperial Bee Honey, and another man reaching out for the tin.